This Sweet Pikachu T-Shirt is $11 Today Only! Before I get into the meat of this post, I just wanted to take a moment and apologize to all of the awesome Fanboy Fashion readers for having gone MIA for over a month. I’ve been dealing with some personal things and haven’t really felt like myself enough to post anything so rather than write sub-standard posts, I figured I just needed to take a break for a while. However, I am finally feeling like myself again and I am ready for things to get back to normal around here so lets get to it! I have been a big Pokemon fan since I was a kid growing up on the Red/Blue games as well as the card game and cartoon. However, until Pokemon X/Y came out a week ago, I hadn’t played any of the Pokemon games in years (not for lack of wanting to but the battery in my old Game Boy cartridges died so it wouldn’t save my stuff anymore and I have just been too lazy to crack them open and replace the battery) but I still love them and I really enjoying the Pokemon X, even if I don’t care much for the newer Pokemon. My how things have changed since I last played in the Gold/Silver days! Anyway, for my fellow Pokemon fans, I have found the perfect shirt(s) for you! The awesome folks over at TeeFury are selling this really cool Pikachu t-shirt designed by Whitebison for just $11 today only! 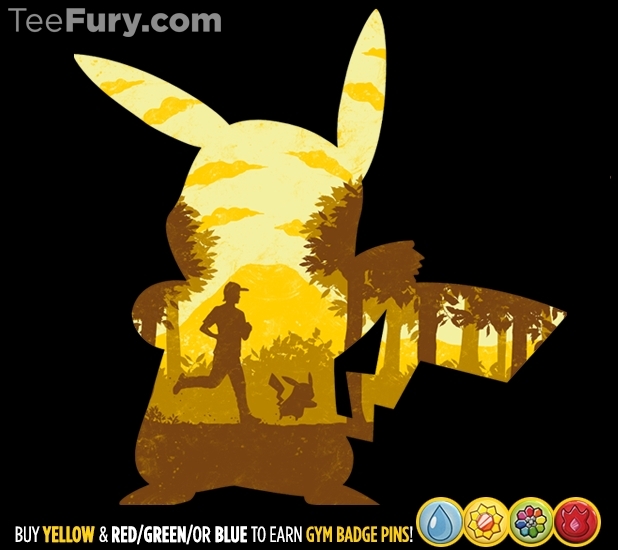 If that isn’t cool enough (this is honestly the coolest Pokemon shirt design I have ever seen), if you order one as well as one of the companion shirts which features either Charmander, Squirtle or Bulbasaur from their gallery, you will also get a cool gym badge! I should note those t-shirts are $18 but the designs are equally as cool as Pikachu so I think they are still worth it. Of course any true Pokemon fan will have to collect all 4 shirts! Share this with any Pokemon fans you know! Like Fanboy Fashion on Facebook too!